In China, no matter what you do, the competition could be always tough. And if you have to face a few competitors, the most important factor to win the market is the Speed, i.e. fast development, quick execution plus efficient marketing. QFPay is the first Square-like mobile payment solution we reported in early August, it is still in stealth mode; 99Bill’s Kuaishua is the second but there is still no sign of its official launch. Here comes the third, called Yeahka, developed by a company based in Shenzhen. The thing is, it is officially launched! Yeahka’s solution looks exactly like Square: the card reader is plugged into the audio jack. The card reader priced at rmb 9.8 (~$1.5) is now on sale. The application is also available for both Android and iOS. 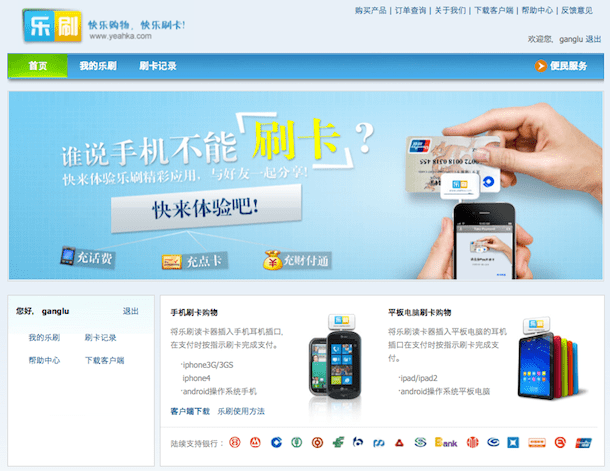 Yeahka now only supports two banks: Industrial and Commercial Bank of China and Construction Bank of China and on its sites it says more banks will be supported soon. As described on Yeahka’s site, with Yeahka’s solution you can now top up your phone credits, deposit money to your Tenpay (the payment gateway operated by Tencent) account and buy credits for game cards. Users can also logon Yeahka’s site to check the transaction history. I’d love to buy one card reader and give it a try.